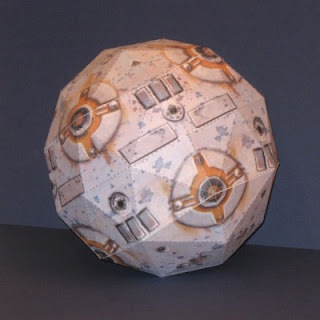 This star wars papercraft is a Training Remote, created by tektonten. Remote was a broad word to describe an entire class of restricted automatons. These automatons had no independent initiative, and only acted on orders given by their owners. Like droids, remotes possessed a limited degree of intelligence and drew from a library of preprogrammed instructions and past experience to complete their tasks. The remotes themselves were usually fifteen centimeter diameter spheres covered with maneuvering thrusters, laser emitters, and sensors.